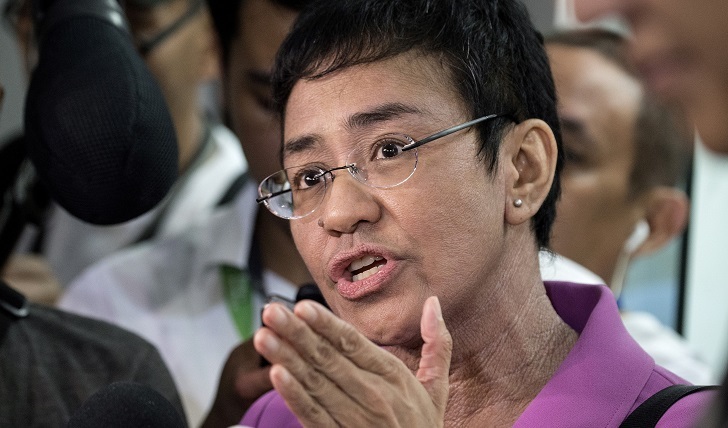 Philippine journalist Maria Ressa, whose news site has repeatedly clashed with President Rodrigo Duterte, was arrested in her Manila office on Wednesday in what press freedom advocates branded an act of "persecution". Her detention on a charge of "cyber libel" is a dramatic escalation in government pressure bearing down on Ressa and her website Rappler, which was already facing tax evasion charges that could shut it down. It comes after Duterte has cracked down on high-profile critics in the press and legislature who dared criticise his signature anti-drug campaign that has killed thousands. "She's been arrested and she's been read her rights," Rappler co-founder Beth Frondoso told AFP. "Fingers crossed -- we'll try to post bail tonight." Ressa, who was named a Time Magazine "Person of the Year" in 2018 for her journalism, left the Rappler offices with plain clothes officers and surrounded by cameras. "The case is ridiculous and the fact that they issue an arrest warrant is a travesty of justice," Ressa told journalists after her arrest. "This is what journalists in the Philippines now have to go through," she added. Authorities said she could be released as soon as bail was paid, but the process for that was unclear and she may spend the night in jail. Rappler has drawn the administration's ire since publishing reports critical of Duterte's so-called war on drugs that critics say has targeted the poor and could amount to crimes against humanity. However, the new case against Ressa and former Rappler reporter Reynaldo Santos, Jr. stems from a 2012 report written about a businessman's alleged ties to a then-judge on the nation's top court. While investigators initially dismissed the businessman's 2017 complaint about the article, the case was subsequently forwarded to prosecutors for their consideration. Philippine journalists immediately attacked the surprise serving of the warrant at Rappler headquarters. "The arrest of ... Ressa on the clearly manipulated charge of cyberlibel is a shameless act of persecution by a bully government," said the National Union of Journalists of the Philippines. "The government ... now proves it will go to ridiculous lengths to forcibly silence critical media," it added. Amnesty International also swiftly condemned the arrest as "brazenly politically motivated". "In a country where justice takes years to obtain, we see the charges against her being railroaded," the group said in a statement. The Philippines tumbled six places last year in Reporters Without Borders rankings of press freedom to 133rd out of 180, with the body noting the government has pressured and silenced critics. He had threatened to go after their owners over alleged unpaid taxes or block the network's franchise renewal application. Some of the drug crackdown's highest profile detractors have wound up behind bars, including Senator Leila de Lima, who was jailed on drug charges she insists were fabricated to silence her. Presidential spokesman Salvador Panelo said the cases against Ressa had nothing to do with her work as a journalist. "This has nothing to do with freedom of expression or the press," he told broadcaster ABS-CBN. "Regardless of who commits any crime, he or she will be charged in accordance with the law." Justice secretary Menardo Guevarra told AFP Ressa could be released as soon as she pays a cash bail. In the tax case, the government accuses Rappler Holdings Corp., Ressa and the site's accountant of failing to pay taxes on 2015 bond sales that it alleges netted gains of 162.5 million pesos ($3 million).